Lieutenant Joel Gilmore is part of a multi-species observation team on a hidden base in a distant solar system, when they find themselves under attack by the very aliens they were meant to be watching. 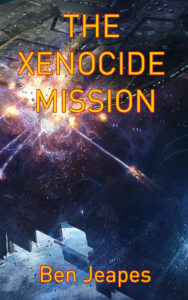 Joel and his allies, the enigmatic Rusties, must explore the parameters of trust in a lethal confrontation with a deeply alien third species: one with a proven predilection for xenocide on a planetary scale. Meanwhile the humans and the Rusties rush to their rescue – but as it turns out, are they any better?